Specific Industry: Urban Keys Chartered Surveyors is a new, modern and dynamic real estate agency in Cyprus providing all real estate services, including buying, selling, renting and letting residential and commercial properties throughout Cyprus, as well as property surveying and valuations. Urban Keys is also a pioneer in introducing a number of new real estate initiatives for a changing economy. Complete website solution, including initial consulting, online business strategy, web design concept, programming development for design structure, fully customised Content Management System (CMS) for updating property listings and other content, real estate industry content research & writing, editing, SEO analysis and implementation, online and Internet marketing business strategy, tracking & monitoring, domain, hosting service. 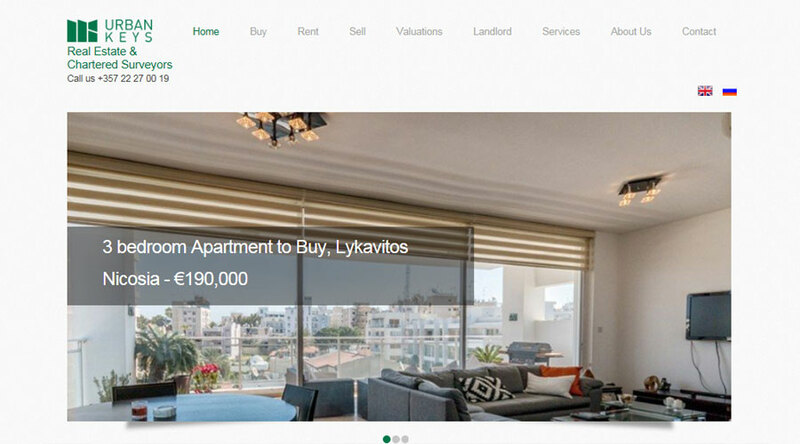 Newly established Nicosia-Cyprus based real estate and chartered surveyor, Urban Keys approached Web-Conceptions to take care of their website project after seeing their work with the newly launched PrimeStar-Estate website. Word-of-mouth spread quickly. In Cyprus, real estate is one of the most competitive sectors, together with professional services and tourism. As such, it was always going to be a challenge to produce a website that not only ranks well, but achieves results by encouraging visitors to call-of-action. In any case, it was fundamental that client had good web presence, both for corporate image (i.e. as reference to the newly established firm to potential clients), as well as for listing properties. Indeed, marketing the website would also be an ongoing process, with online strategies, as well as other marketing mediums, namely revealing the URL on property billboards and in print media. The plan was to produce a website that was consistent with the real estate agency's positioning of being fresh and dynamic. Focus on this website was on a new approach in presenting information, in line with the company's fresh and dynamic positioning. Providing resources in each main area, including buying, selling, renting, landlords and valuations. The same holds true with searching for such properties via a traditional search function, as well as an interactive map. This was a balance of static content and CMS generated content. Detailed content research and copywriting was fundamental, ensuring good online presence and search engine ranking. Regular meetings were also required with this client, in order to brainstorm new ideas, verify suggestions and work already done, and for website and CMS training purposes. Website Content: when it comes to search engine optimisation, content is King. This real estate website needed to have a good amount of content that was not only informative, but also relevant for SEO purposes, i.e. scattered with specific key words and phrases. Of course prior to this, a thorough analysis had to be conducted on what key words and phrases key feeder markets (in this case Cyprus, the UK, other EU and Europe, Middle East, as well as emerging markets Russia, CIS and China) normally search (in Google, Yahoo, Bing and other engines) when seeking a real estate agent or buying/renting properties in Cyprus. Content focussed on Urban Keys as a new real estate agency, and all services provided, as well as general information on the real estate sector in Cyprus. Maintaining areas of content was set up with a customised CMS, namely news, property price benchmark, and of course property listings. Website CMS: this was an important element of the website, in order to offer visitors ongoing dynamic and added-value content and information on real estate services provided by Urban Keys Chartered Surveyors, as well as general information on the real estate sector in Cyprus. In doing so, content would also benefit SEO. Web-Conceptions planed out and build a fully customised CMS in line with what Urban Keys needed, as well as components suggested by Web-Conceptions in order to benefit an entire digital marketing campaign. Property listings, for buying and renting residential, commercial and industrial properties in Cyprus. Map functionality for searching real estate. New real estate initiatives for renting and buying property in Cyprus, brought about due to the economic situation. Company news, for regular corporate and Cyprus real estate sector updates and then sharing via social media. This helps generate traffic back to the website and overall interest in the company and its services. Official property valuation price benchmark, as presented by the Central Bank of Cyprus and RICS Cyprus.